There are 7 main chakras that relate to different physical regions, organs, nerve clusters, meridians, emotions, thought patterns. These energy centres are explained by Anodea Judith (Eastern Body Western Mind) as disks of belief/programs and like a software program they can be out of balance, and in need of some updating and can be re-programmed. In this workshop we will delve deep and journey into each chakra, exploring and feeling into your own energy centres with chakra meditation, guided chakra energy healing, as well as chakra art, and sound that tones and balances each chakra. 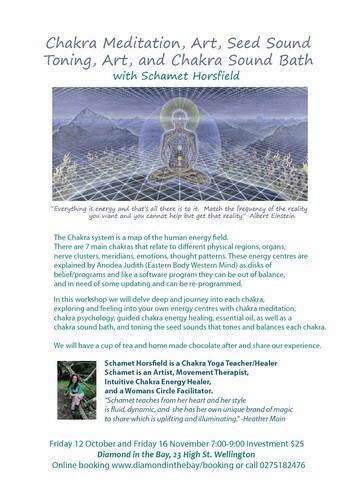 This is a fun and informative workshop and you will leave with a deeper understanding of yourself, your energy, the programs you run and you will take home some beautiful chakra art too!